A new kind of community. At Affinity we’ve created a new kind of 55+ lifestyle community for people who are ambitious about the years ahead and aren’t willing to compromise their freedom. Our vibrant communities attract people who are looking to get the most of out life. Rents start at $1,285 and include utilities. Whether you’re retired or not, living at Affinity is a great strategy for downsizing, conserving time and money for more living. Austin is more than a city, it’s a cultural hub of Texas. So whichever Affinity Living community you choose, all of the advantages of a thriving destination are yours to enjoy. 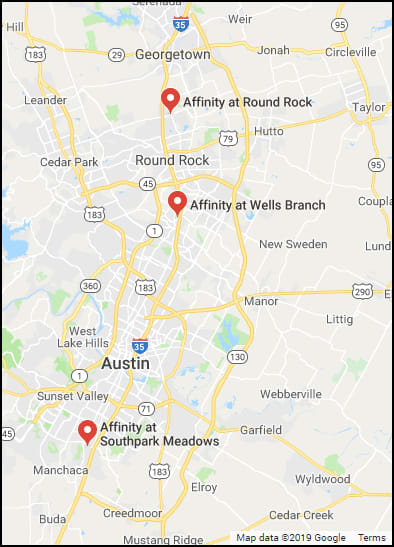 All of our Austin locations are located in flat neighborhoods within a short walk or drive of amenities, shopping and restaurants. Austin is a perfect home base for your adventurous spirit! Visit our Wells Branch, Southpark Meadows, and Round Rock websites for more information.